A water softener system softens hard water by removing chemicals and sediment. Hard water can damage pipes and prevent detergents from dissolving correctly. Water softening systems remove calcium from the water, replacing it with salt. 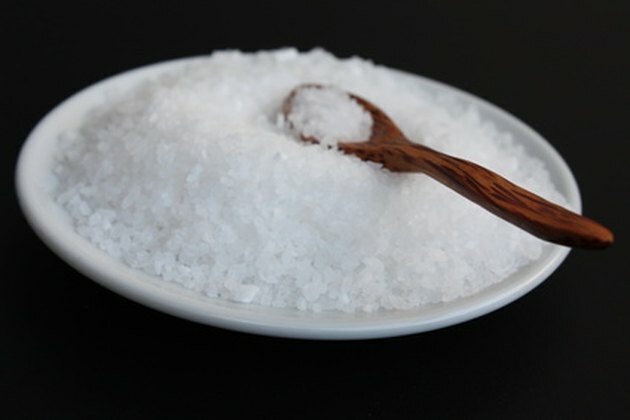 Three salt options are most commonly used in the systems: rock, solar and evaporated. The time will come, however, to replace the water softener. This will make disposing of the salt a necessity. Salt from water softeners does not pose an environmental hazard, so you have several options for getting rid of the salt quickly and safely. Water softeners replace calcium in water with salt. Remove the salt from the water softener and place it in a bucket. Place the bucket of salt in a wooded area where deer are known to live. Deer will come and eat the salt. Sprinkle the salt in an area overgrown with weeds. The salt will kill all vegetation in the area. Wait a few months to grow anything in the spot, to make sure the salt has been absorbed or washed away. Save the salt until winter. Sprinkle it on icy driveways and patios. The salt will provide traction and help melt the ice. Dump the bucket of salt into a trash bag. Set it out with the rest of the garbage. Fill a bathtub with water. Place the salt in the tub and let it dissolve. Drain the salty water as normal.